The CW has handed down early renewals for three of their most successful shows — Arrow, Supernatural, and The Vampire Diaries. Arrow has been the only new ratings hit this season and will return for a second round. Though Supernatural is the network’s oldest scripted series, it’s one of The CW’s best performers and will be back for year nine. The Vampire Diaries is easily the network’s most successful show and will return for a fifth season. 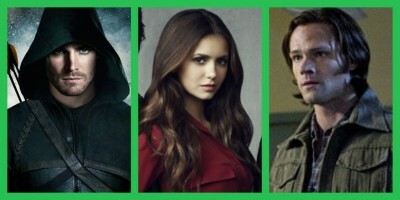 February 11, 2013 (Burbank, California) – The CW Network has given early pickups to three of its hit series for next season, including freshman hit ARROW, its top-rated drama THE VAMPIRE DIARIES and fan favorite SUPERNATURAL, it was announced today by Mark Pedowitz, President, The CW. All three shows will return in Fall 2013. One of the true breakout hits of the season, ARROW posted The CW’s best series premiere since 2009 and currently stands as the network’s most watched show (4.3mil). Heading into its fifth season next fall, THE VAMPIRE DIARIES remains The CW’s highest rated series in target demographics, including adults 18-34 and women 18-34. THE VAMPIRE DIARIES also continues to be one of the network’s top performing shows digitally and socially; in fact, THE VAMPIRE DIARIES recently topped Trendrr’s list as network TV’s #1 social program for the week of January 21-27. The Winchester brothers of SUPERNATURAL will continue to fight the forces of evil for a ninth season. Since being paired with ARROW on Wednesday this year, SUPERNATURAL has seen a dramatic uptick in its ratings from last season, rising 15% among total viewers, 10% in adults 18-34 and 18% in adults 18-49. What do you think? Are you happy to hear about these renewals? Which of the three do you think is better? Which CW show would you like to see renewed next? More about: Arrow, Arrow: canceled or renewed?, Supernatural, Supernatural: canceled or renewed?, The Vampire Diaries, The Vampire Diaries: canceled or renewed? Please continue to air supernatural!!! I LOVE this show its the only show I watch and I own all seasons of SUPERNATURAL on DVD!! The casting team should add mixture stories from thai horror stories(freaky true stories) to other true horror stories from all over countries! I’m thrilled that “Supernatural” will air again. Love the show. Hope they get to season 100 at least 🙂 I’ll be watching it all the way from Romania. Can’t wait! ABSOLUTELY LOVE SUPERNATURAL & VAMPIRE DIARIES. Haven’t watched Arrow but im sure i will.